If you like the Jayne Frost books then you will enjoy this book. Nice progression on story line. Existing characters fit well with story and do not feel thrown in. 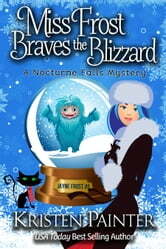 Miss Frost Braves The Blizzard by Kristen Painter Book 5 of this paranormal cozy mystery series in the town of Nocturne Falls. While this is the best of the series to-date, I would recommend reading at least a couple of the prior books to get the full benefit of this wonderful plot line. Outright fun and entertaining. A portal is accidentally opened between Nocturne Falls and the North Pole and some of the things entering? Not so nice. It’s up to Princess Jayne and her friends and family to put everything back where it belongs. “Santa Claus is coming to town.” Yep, that line for the book slayed me? An except about the Princess’s character: “I headed for the fridge. “I need something stronger than coffee this morning.” I pulled out a bottle of Dr Pepper, unscrewed the top and downed about half of it. Which was going to result in a very un-princessy burp, but certain things couldn’t be helped. Maybe I could hold it until I was in the shower.” Excerpt From Miss Frost Braves The Blizzard By KristenPainter An insider memory - have you read the novella “When Birdie Babysat Spider”? - the below tickled me. Excerpt: “Both cats seemed especially interested in Jack. Perhaps it was the shifter side of his familiar kind. He could transform himself into a raven, after all. In fact, I could have sworn Spider licked him” Excerpt From Miss Frost Braves The Blizzard by KristenPainter This material may be protected by copyright. Another fun and enjoyable read by Kristen Painter! The Nocturn world grows in detail with each books and a reader cannot help but become emotionally attached to her characters.